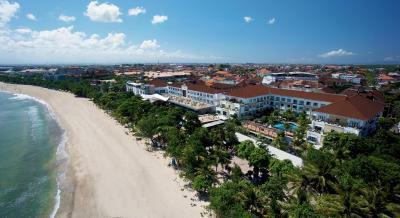 Lock in a great price for Grand Inna Kuta – rated 8.2 by recent guests! This is a resort, I was thinking it was just a hotel.. so it exceeded my expectations. The staff is trained to be very friendly and accommodating to guests, and they were. At least 2 very nice pools, one in front of the beach, the other more private inside the hotel area. This place is good for an affordable upgrade over stayIng in backpacker hostels for an entire trip. Big comfy bed, great spread for breakfast, friendly staff & very good location. We stayed at the pool access room to the Kelapa Pool. Very nice view. Even the view from the breakfast restaurant HQ is beautiful. Location, comfortable, very neat and friendly staff. Staff were great, very courteous, helpful and a delight. Location is really good and everywhere is walking distance. The room was clean and the Wifi was really fast. The swimming pools were clean and beautiful. The breakfast was OK. The staff were very friendly and helpful. Stayed one night super close to the airport. Super comfortable bed, free water and sodas in the refrigerator, thanks for the late checkout, wonderful included breakfast, great location right on the beach, massage spa at the hotel was amazing with 50% discount offered. Took a wonderful run along beach boardwalk towards the airport that passes many amazing hotels you can stop by for a drink or lunch/dinner later in the day. 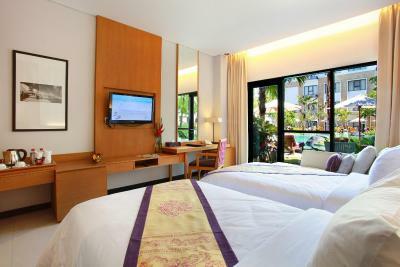 Grand Inna Kuta This rating is a reflection of how the property compares to the industry standard when it comes to price, facilities and services available. It's based on a self-evaluation by the property. Use this rating to help choose your stay! 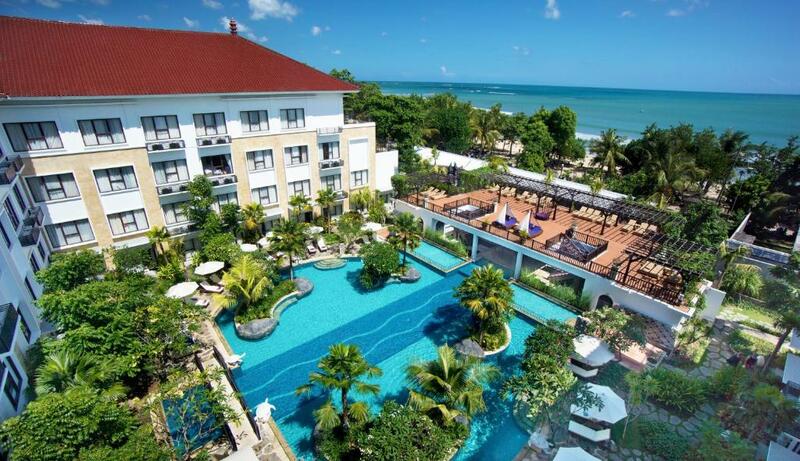 One of our top picks in Kuta.Welcoming guests to the iconic Kuta Beach, Grand Inna Kuta features an outdoor pool, various dining options and free buffet breakfast. All areas offer free Wi-Fi. Free parking is also available. 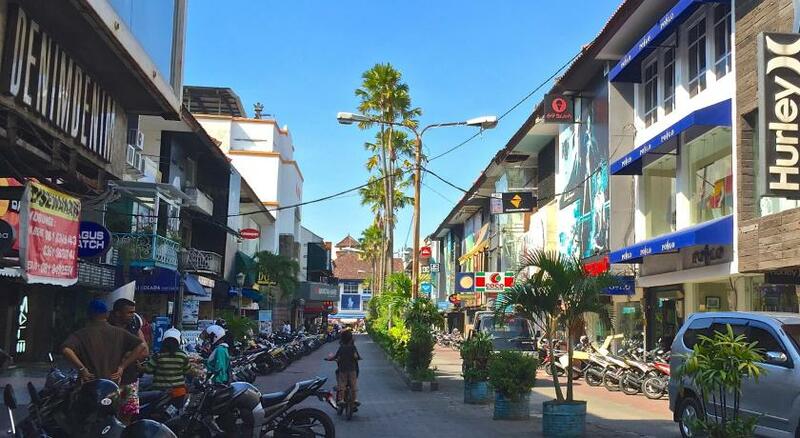 Grand Inna Kuta is a 1-minute walk from Kuta’s shopping streets and a 2-minute walk from Kuta Art Market. Surfing and other water sport options are a 1-minute walk away. 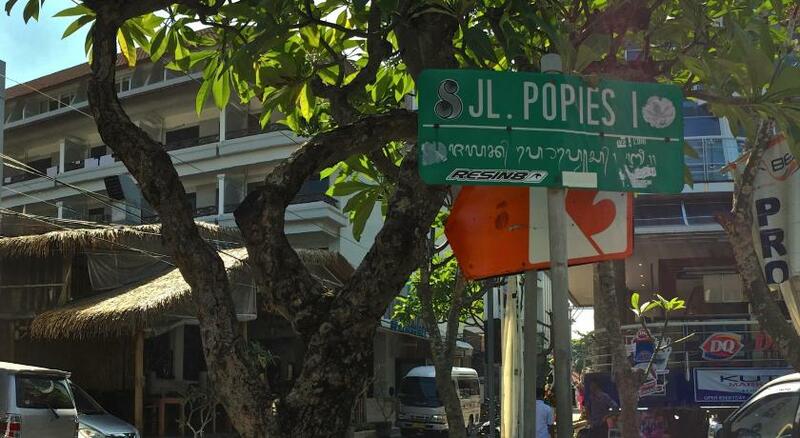 The hotel is located 3.1 mi from Ngurah Rai International Airport, and airport shuttle service is available at an additional cost. At this property the rooms are all air-conditioned and nonsmoking. The private bathrooms are spacious and come with bathroom amenities and slippers for your comforts. Mini-bar, tea/coffee maker and 24-hour room service are also provided for your convenience. Services include tour desk, money changer, drug store and valet parking service. 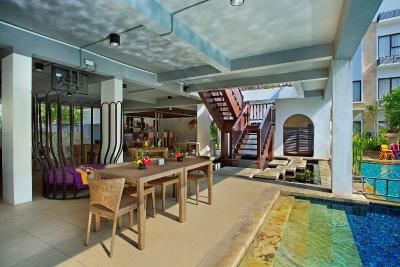 Guests can savor on drinks and light meal while enjoy a relaxing swim at the Sunken Bar or at Kelapa Pool Bar & Snack. 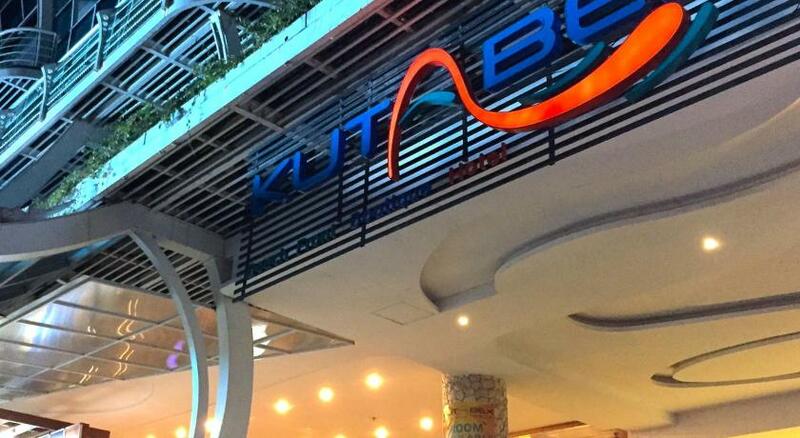 Putri Duyung Cafe and Breeze Restaurant serve Western and Indonesian dishes. 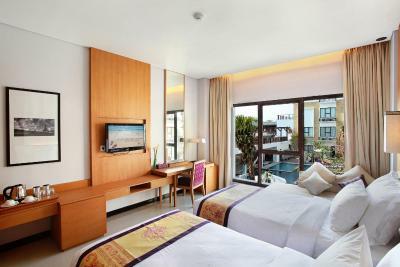 When would you like to stay at Grand Inna Kuta? Boasting modern minimalist-style interiors, this room has a private bathroom with a shower. 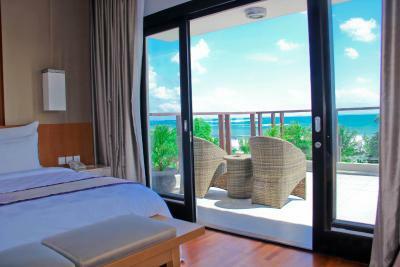 Featuring sea views and modern minimalist-style interiors, this room has a private bathroom with a shower. Offering direct pool access and modern minimalist-style interiors, this room has a private bathroom with a shower. 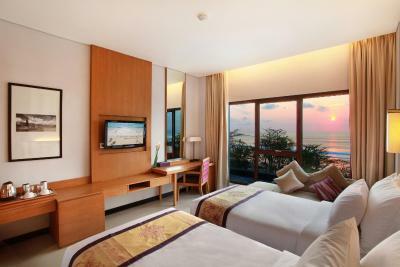 This spacious suite is fitted with air conditioning, a flat-screen TV and a mini-bar. It has a seating area and a private bathroom. Slippers and free toiletries are provided for extra comfort. Offering views of the pool and modern minimalist-style interiors, this room has a private bathroom with a shower. On the ground floor of the property, this air-conditioned double or twin room provides a terrace and direct access to the pool. 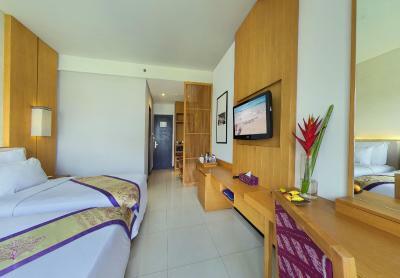 The room also comes with satellite TV, free Wi-Fi access, and a minibar. 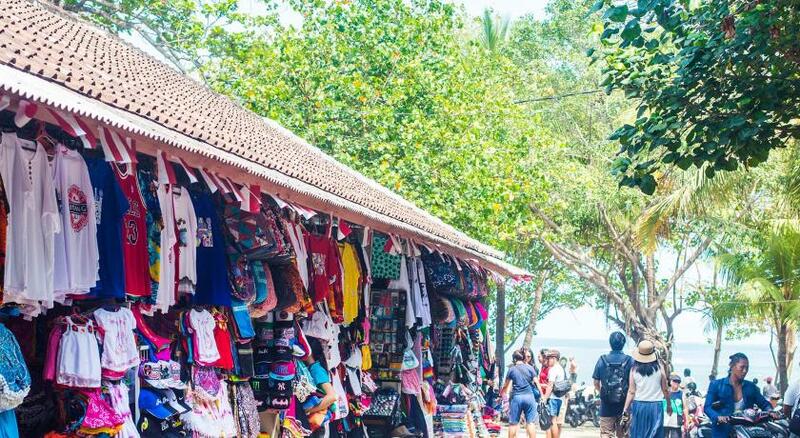 Located on the white sandy beach of Kuta with its beautiful sunsets, Grand Inna Kuta offers direct access to the famous Kuta Beach besides a mere 5 - 10 minute walk to the shopping center and entertainment areas. 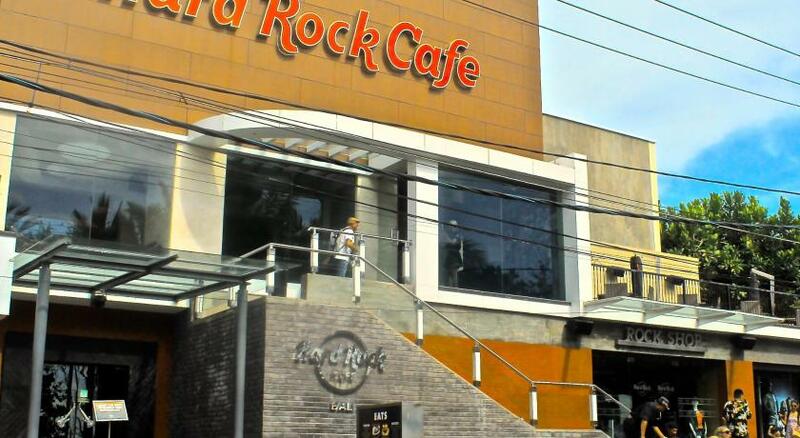 Only 3 miles from Ngurah Rai International Airport, 6 miles from Denpasar City. 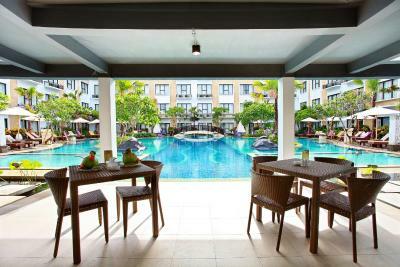 House Rules Grand Inna Kuta takes special requests – add in the next step! 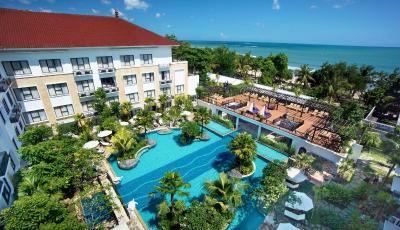 Grand Inna Kuta accepts these cards and reserves the right to temporarily hold an amount prior to arrival. Rooms are old and not well maintained.Pillows and beds were too hard.Staff were not very accommodating.Noisy, noisy, noisy.room doors being closed, furniture moving, chatter normal client behaviour proving to be very noisy and annoying. Staff at reception were lovely.Very welcoming and pleasant.The pool was nice we swam at the sunken bar pool for the swim up bar.The location is good, right in the middle of it all.House keeping was good. The pillows were hard. A few hooks or somewhere to hang wet clothes would be good. We had two different rooms and both were really dirty and worn out. Air condition was too cold all the time. I have been to other places that had a lot more variety. I think the breakfast was average. The location was good, in front of the beach. Place a little old, bathrooms show their age. Every thing. Staff, location & hospitality. Not many electric points in room. Was tricky to charge phone and computer.